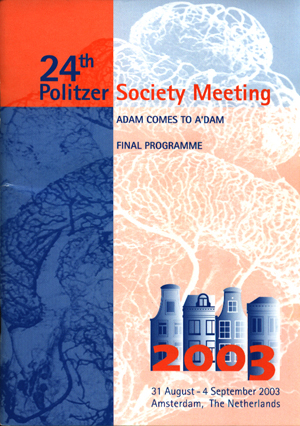 The 24th Politzer Society Meeting 2003 took place in the Amsterdam RAI Congress Centre in The Netherlands from 3ist August to 4th September, 2003. Since the foundation of the Politzer Society in 1971 by the late Claus Jansen from Germany, 23 successful meetings have been organized. Claus Jansen, who was the founder of the Politzer Society, held the first meeting in his own region, Gummersbach and organized many Politzer Society meetings thereafter. The first inter-national Politzer Society meeting was organized in Davos, Switzerland in 1978 and almost every year after this meeting, an international meeting took place somewhere around the globe. The aim of the Society was to create a forum for ENT surgeons who were particularly interested in chronic ear diseases and the surgical treatment of hearing losses. The Politzer Society meeting has been held in The Netherlands before. 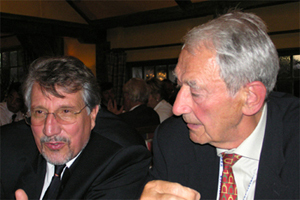 In 1991, the meeting was held in Maastricht where the chairman of the meeting was Professor Ed Marres. At the 2000 EUFOS meeting, Amsterdam was elected to be the host for the 24th meeting and for two and a half years, the local organizing committee together with the program advisory board of the Politzer Society, have been working very hard to cre­ate a program full of different, interesting otological topics and subjects that make modern Otology so interesting. Under the slogan 'Adam comes to Adam' the official opening of the meeting was on August Sunday 3ist in the great forum hail of the RAÄ° congress centre. 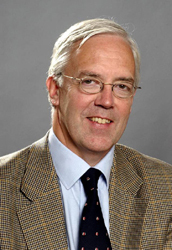 Welcome words by the President of the Dutch Otorhinolaryngological Society, Professor Gert Jan Hordijk, were followed by an open­ing lecture entitled 'On Pioneering, Priority and Progress in Otology' presented by founder member of the Politzer Society, Professor Egbert Huizing. Professor Mirko Tos, President of the Society opened the 24th Politzer Meeting. At the welcome reception all the participants could enjoy a special Dutch delicacy - fresh herring. The scientific meeting started on Monday with the plenary opening lectures by Alan Kerr (past President), Jacques Magnan, Gordon Hughes and Mirko Tos. After a coffee break the special sessions on Otoplasty and Tubal Dysfunction were well attended. In the session on Tubal Dysfunction the lecture hail was almost overbooked. At lunch time a satellite symposium was organized by MED-EL. Meatoplasty (Chairman: lain Swan) and Baromedicine in Otology (chairman: L Feenstra) were the topics of the afternoon sessions. During the day free papers and key lectures were presented simultaneously. At the end of day one a pro & con session on 'Vestibular Schwannoma Surgery' or 'Wait & See' was conducted by Per Möller and discussed by Sven Stangerup and Mislav Gjuric. On the following days, the program started with special instructional sessions (Meet the Profs) under the auspices of the EAONO (European Academy of Otology & Neuro-otology). On Tuesday Cochlear Implantation was one of the topics together with Otosclerosis and Stapes Surgery. Key lectures by John House, Noel Cohen and Bruce Black on cochlear implants (CI) were followed by a round table discussion 'CI-what's new?' monitored by Srecko Branica. The Otosclerosis ses­sion moderated by Erwin Offeciers was followed by the interesting round table discussion (Chairman: Andre Chays) on 'Which Piston in Stapes Surgery?’ During the lunch break a satellite symposium which focused on treatment of Meniere's disease was organized by Medtronic Xomed. Key lectures, free papers and a pro/con discussion on Endoscopic Middle Ear Surgery (Muaaz Tarabichi, Rinze Tange & Mirko Tos) took place on the after­noon of Tuesday. Tuesday was ended with by a social event. A city tour with a visit to the well-known Heineken brewery was on the program. Many of the participants enjoined the museum and the original taste of famous Dutch beer right on the spot where it is produced. On the third day of the congress, Lasers in Otology (Rudolph Hausler- President of the next Saas Fee meeting), Otitis Media (Anne Schilder) and Skull Base Otology (Bernard Pauw) were the topics beside the interesting free papers. Entermed & Gyrus organized a satellite symposium on different new pros-theses in Otology. In the afternoon the attention was focused on Oto-allergy (moderator Paul van Cauwenberge) and Evidence Based Medicine in Otology presented by Matthew Yung introducing the prospect of a multi-centre audit. Case reports were highlighted by Thomas Somers, Wilko Grolman and Robert Stokroos. The social highlight of the 24th Politzer Society Meeting was the boat tour through the Amsterdam canals followed by a special cocktail on a 16th century VOC ship in the port of old Amsterdam. After enjoining the drinks and snacks the participants dined in the Dutch maritime museum. Jan Vayne, a phenomenon on the grand piano, played during the outstanding dinner. On the last day of the meeting, round tables on Tympanoplasty (Karl-Bernd Huttenbrink), Meniere's disease (Thomas Mc Donald) and BAHA (Cor Cremers) were on the program. An interesting discussion on meningitis and cochlear implant was monitored by Gerry O'Donoghue. 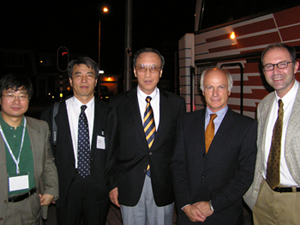 At the end of the Congress Jan Grote introduced the preliminary program of his Cholesteatoma 2004 Congress and Chong Sun Kim showed us a fantastic preview of the 25th Politzer Meeting to be held in Seoul in 2005. In conclusion, almost 400 otologists from all over the world enjoined a wonderful scientific otological meeting in one of the finest historical cities of Europe - Amsterdam. The local organizing committee thanks all the participants, the supporting companies, Eurocongres organization, Med-Promocom and especially Margalith van Huiden, our secretary, for their effort to make the 24th Politzer Society Meeting a memorable scientific and social event.